The coming weekend will see the start of the Silk Way Rally, the most outstanding cross-country rally of Eurasia. The 2012 edition will set off from the Red Square in Moscow on Saturday, June 7 and in seven days it will take the competitors down to Gelendzik on the coast of the Black Sea. Among them will be Andris Dambis and Maris Saukans in their recently upgraded range-extended electric vehicle OSCar eO entered by Team Latvia. 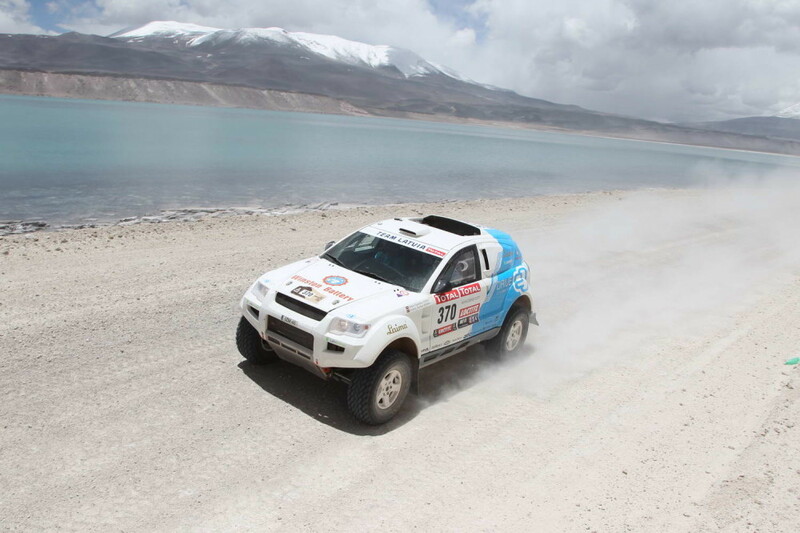 Originally conceived as a support race for the legendary Dakar rally, the Russia based Silk Way Rally is now an independent and major motorsport event in its fourth year running. It is widely recognised for the warm Russian hospitality and has strong support from the government. There is no better way of measuring its reputation among competitors than looking at the 115 car long entry list representing 25 nations. Overdrive, Schlesser, Dessoude, KAMAZ, MAN, MAZ and many other teams will line up their vehicles for an epic battle through the steppes of Volga, deserts of Kalmykia and mountains of Caucasus. The total rally distance is 3860 km with over half of the route made up of timed special stages. The electric drive OSCar eO of Team Latvia will carry race number #118 with its chief engineer Andris Dambis at the wheel. Maris Saukans, participant of the Silk Way Rally since its first edition, will swap his usual driver’s seat for a debut as a navigator. Two assistance vehicles with engineers and mechanics will support them along the route. Team’s main target in Russia is to prove the outright competitiveness of the electric drive car against the conventional rally raid machinery. In preparation for that, OSCar eO has come a long way since its historic finish in the Dakar Rally earlier this year. The engineering team at Drive eO has revised vehicle’s transmission, cooling system, electric motor control and the in-house chassis supervisory controller. This has added a lot to the dynamics of the car and recent road testing has validated a new top speed of 150 km/h, a 20% increase from the Dakar-spec level. The operating principle of OSCar eO remains unaltered. It is still a fully electric car with all the propulsion power provided solely by electric energy. A permanent magnet synchronous motor, capable of producing 800 Nm torque and 335 kW peak power, is coupled directly to the all-wheel-drive transmission. An on-board electric generator, known in automotive industry as “range extender”, allows recharging the battery pack to meet the stipulated autonomy of 800 km. Its prime mover is a petrol heat engine which operates at a high efficiency and hence a relatively low fuel consumption. This means that during a rally there is no need for external charger to be plugged in the OSCar eO. The range extender is powerful enough to charge the battery pack to 80% level in a matter of 30 minutes. Organisers of the Silk Way Rally have worked hard to ensure a fantastic media coverage. Eurosport Events production staff will bring the rally footage to 63 television networks in 197 countries. Live results will be available on silkwayrally.com. Team Latvia will be posting its short messages on Twitter @kdambis.